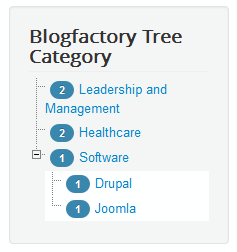 Displays a list of blogs, the criteria of selecting them and how many to be displayed can be set from backend. Clicking on one of the blogs will redirect the users to it. 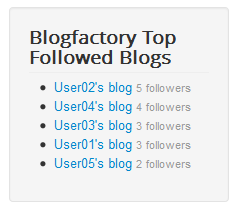 You can choose for this module one of the four available Types that determinate which blogs to be displayed, Latest, Random, Top active or Top followed. 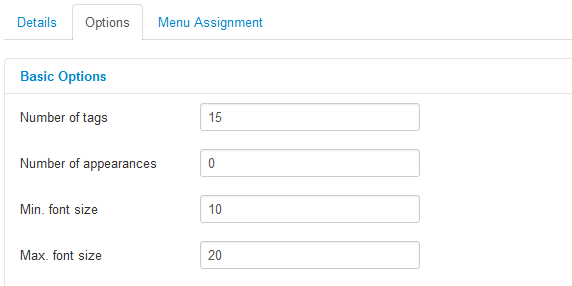 Set how many blogs will be displayed on the module on the Number of items field. 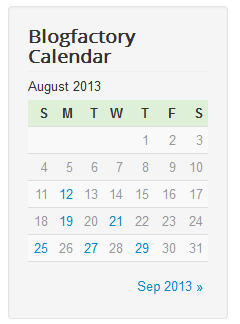 Displays a calendar box where users can navigate through dates and click on the days where posts were created. 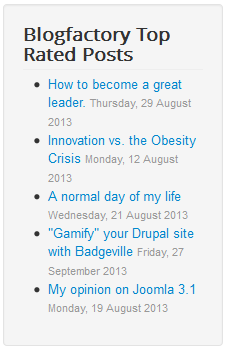 Clicking on one of the days will display all the posts created on that respective day. The configuration part of the module allows you to select the format of the Navigation links changing how many months are displayed and if the year is displayed as well. Select which day to be displayed as first of the week, Sunday or Monday. Displays a list of posts and the date when they have been created, the criteria of selecting the posts and how many to be displayed can be set from backend. Clicking on one of the posts will redirect the user to a detailed view of it. From backend, you can choose the criteria of which posts will be displayed by selecting the Type: Latest, Random or Top rated. 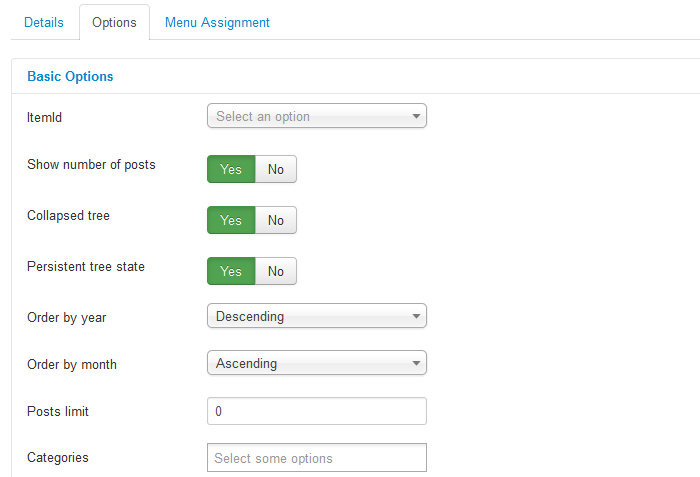 Set how many posts will be displayed on the module on the Number of items field. 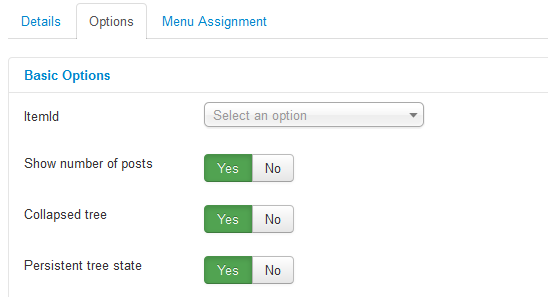 Besides these, you can also select certain Categories to display posts from. Selecting none will display from all of them. 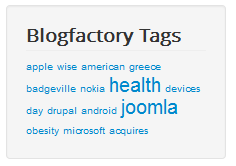 Displays a tag cloud with the most used tags on posts. Clicking on one of them will display only the posts that have the respective tag related to them. Set how many tags to be displayed on the cloud from the Number of tags field. Enter 0 to display all of them. Number of appearances will require tags to be used a set number of times before being displayed on the module. Set the Minimum and Maximum font size in pixels that will be used to display tags. This is used as a relevancy between less and most used tags to distinguish them easier. 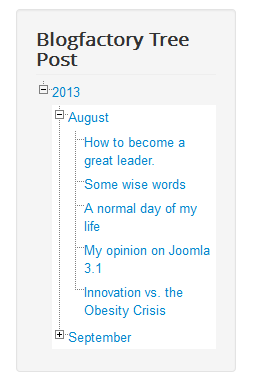 Displays a list of the categories containing posts in a tree structure that can be expanded/collapsed. Clicking on a category will display all the posts assigned to it. Show number of posts will display how many posts are created for each category. With Collapsed Tree enabled, the initial state of the tree will be collapsed. Persistent tree state enabled will keep the current state of the tree(using cookies) while navigating through the website. Displays an expandable tree with a list of posts sorted by years and months. Clicking on a post will redirect you to the detailed view of it, while clicking on a year or month will show you all the posts made on that respective time frame. Show number of posts will display how many posts were created for each month and year. By enabling Collapsed Tree option, the initial state of the tree will be collapsed. You can change the Order of displaying the years and months to either Descending or Ascending. Set Posts limit for the maximum number of posts to be displayed per month. Adding 0 will display all the posts.